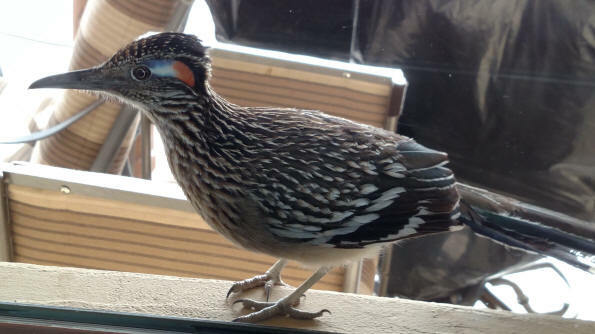 The Amazing Roadrunner, looking in a kitchen window in Carefree! Carefree (PW) No, they never go "beep beep" but this roadrunner would do a "cooing" sound to nearby people. This member of the Cuckoo family can run faster than a human, and even kill and eat a small rattlesnake! The coloring doesn't indicate male or female. The Cave Creek and Carefree areas, are loaded with roadrunners, who will display their astonishing speed when tracking a lizard or small animals. Who's this NBA great? Scroll down for the answer! Biggest home sale in the last year: $7,315,000, in Paradise Valley, 6721 E. Cheney Drive. Over 22,000 sq. ft. 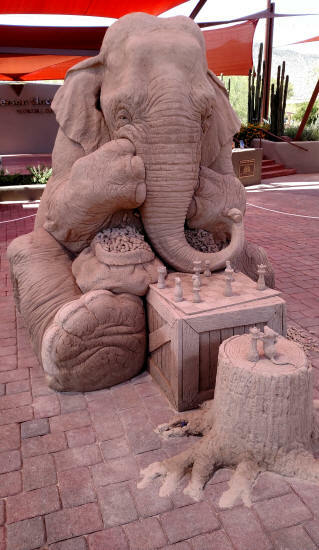 Elephant sand sculpture has everybody talking! World renowned sculptor, Ray Villafane, not only carves pumpkins for Carefree in the Fall, but has made an impact on the sand sculpting community, creating award winning larger-than-life sand sculptures for various attractions and events through out the world. He's been to Russia, New Zealand, Puerto Rico, Italy and now Carefree! Ray also creates the Carefree Pumpkin Garden in October for the Town. Over 30,000 people visited the exhibition with major media outlets traveling the country to see his unparalleled work. How did the delicate work of sand exist for so long? Hint: specially-selected sand, plus a little bit of spray-on glue hardener at the end kept it in shape. 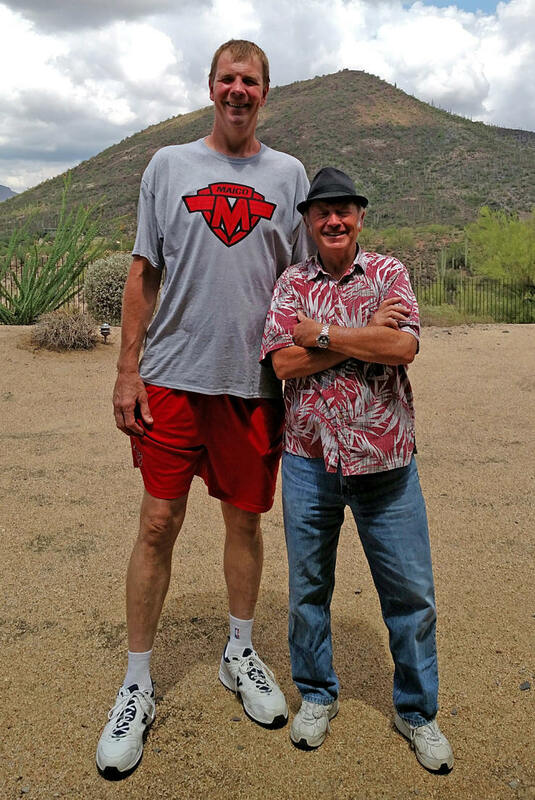 Retired Indiana Pacers superstar, the "Dunkin Dutchman", 7ft.4 inch Rik Smits, who along with his family, have shown an affinity for the Cave Creek area, and desert exploring. On the right, like you wouldn't have guessed, is 6 foot tall Russ Lyon Sotheby's agent, Preston Westmoreland! The Buffalo Chip rises from the ashes! Scheduled for an October re-opening! 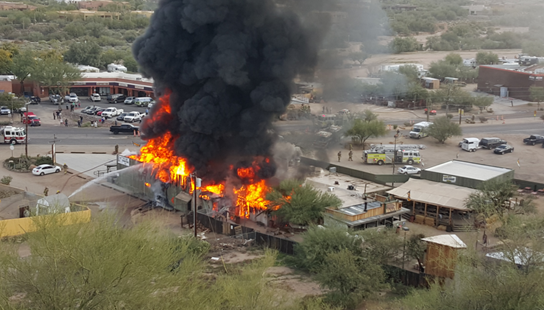 Cave Creek (PW)- Who could have forgotten the sad picture above, as the storied Buffalo Chip restaurant in Cave Creek, burned to the ground from an arson fire on Thanksgiving Day, November 26, 2015. The investigation still continues but talk to anybody on the street, and they'll tell you they know who the suspected arsonist is, but don't have enough proof for a conviction, so she walks freely among us. A shocker. Leaving scores of workers suddenly without a job, with the holidays approaching, a fund-raiser did little to restore all the income they would have had, if the restaurant and entertainment complex had remained fully-opened and operational. The Bull Riding twice a week, and other limited activities continued in some of the undamaged areas, and thanks to owner Larry Wendt, he put the reconstruction and new design on the fastest track possible. By the time you read this, it might be finished and open again, slated for October of 2016. Just like the Phoenix Bird, that rose from the ashes! The "new" Buffalo Chip below, surrounded by a flotilla of workers. Going Once, Going Twice...the auction got the big sale! 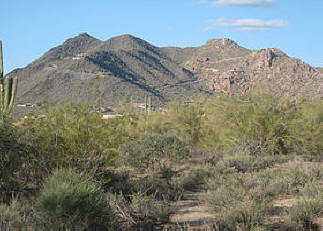 Carefree(PW) The Real Estate market was in a holding pattern in the Desert Foothills this year. Many blame it on the presidential race, others say the economy just has never kicked in again since the recession. Both True. 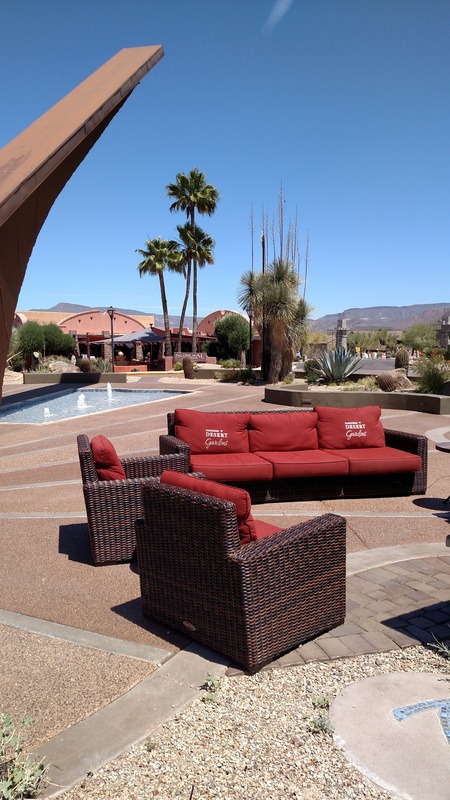 We found that many empty nesters, looking around Cave Creek and Carefree, didn't have the stomach to pick up an older home and start in on expensive rennovations. Many buyers were willing to sacrifice the nice big lots out here, along with privacy, to instead, get a ready-made tract home with that new house smell and a 5-year warranty. Wealthier types just wanted to hold off for a while to see who the next President will be. High-end luxury, unless hugely discounted, were adrift in the ocean, like a luxury liner with engines out. The whole secret to selling out here, no matter what the price, remains the basic: It has to be the best deal on the block. "Shock and Awe" pricing can't hurt either. A year ago, at the end of the buying season, there were 44 homes under contract. This year, about 14 properties. This despite some of the lowest financing rates in history. The biggest sale this year in Carefree, was a home high up on Black Mountain, that sold right before it was due to be auctioned off. Priced at $3.3 million, the selling price was $ 2.35 million. 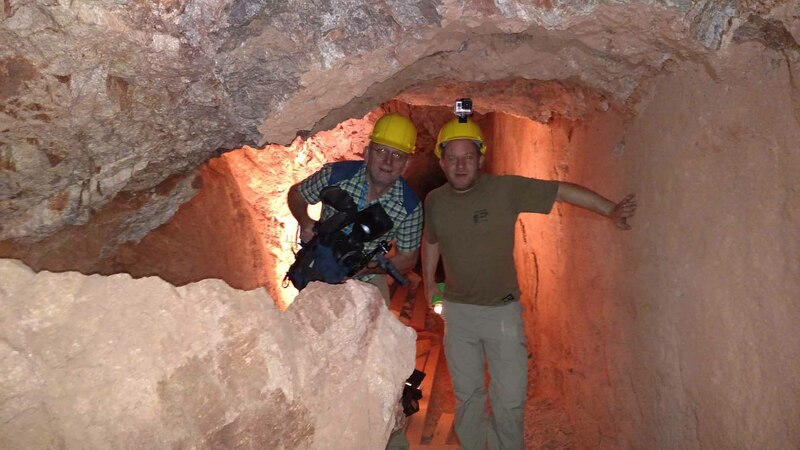 Scottsdale's Gold Hill Mine to be featured by Fox National news! Gold Hill, amazingly, is a remote area just several miles from some of the top luxury golf courses and restaurants in all of Scottsdale! 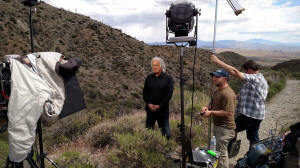 The show will also feature the famous Boulders House, a number of unique Scottsdale properties, as well as the mammoth Octave mining complex near Wickenburg. 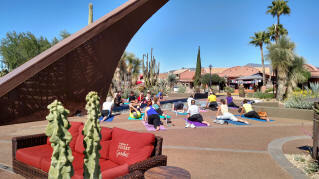 Carefree continues to improve everything in the town center! Relaxing arond the town fireplace beneath the Carefree Sundial just got easier!!" 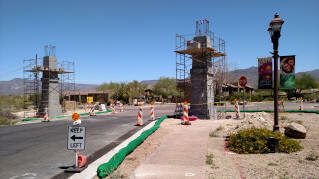 The Town of Carefree is finishing up on scores of improvements made in the last year. 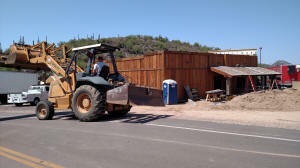 First, the combined bike path project, which Cave Creek and Carefree joined efforts to secure Federal funding, but the bad news was that it all had to be done during the busy tourist season, to secure that funding. 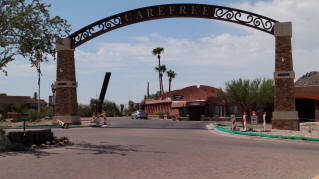 Two huge gateway entrances to Carefree are now in the final stages of completion. See below! Ever wonder why Black Mountain is called "2 mountains in 1?" Geologist Wayne Downey marveled at looking at 3,403-foot-high Black Mountain from the Carefree Highway. "It's two mountains in one," he explained" You'll notice on the West side of Black Mountain, including the summit, that black shale is the predominent rock, while on the East side, dramatic weathered granite boulders comprise the mountain, in similiar fashion to California's Alabama Hills, where countless Western movies were shot. 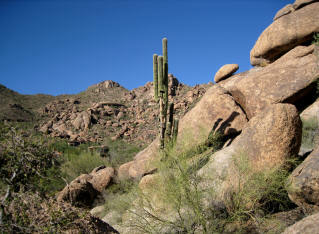 See the contact zone below, where millions of years ago, the Camelback Granite instruded into the mountain, the same rocks that comprise the McDowell Mountains and Tom's Thumb, the Boulders Resort Rock Pile, Troon Mountain and Pinnacle Peak. 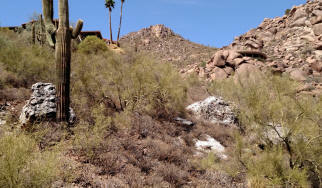 In the picture below, you can see the exact point near the left side of the photo, where the granite boulders emerged. The left side began as mudstone, under water and metamorphosed into shale. 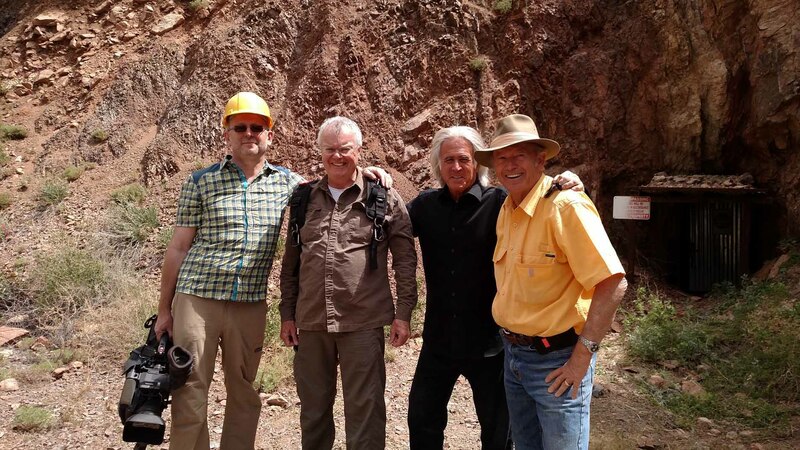 Professor Downey, who has the mineral Downeyite named for him, was especially interested in seeing the contact zone, the area between the two rock forms, which had large quartzite boulders exposed on the ground. He remarked that this might be where you could find some gold! No matter which side of Black Mountain you live on, the area is home to some of most influential business leaders in the US!